Victor George Anderson Bush was the youngest son of the late Admiral Bush, and of Jean I. Bush, of 21, Lauderdale St., Edinburgh, and was born at Bangkok, Siam in 1893. He was a pupil at George Watson’s College from 1907-1911 and gained the Convener’s Medal for Drawing. He played for the 2nd XV. On the outbreak of war, he enlisted in the 9th Royal Scots. In a few weeks he obtained a commission in the Highland Light Infantry and served with that regiment in France until 1916. He transferred to the Royal Flying Corps, and was made Fighting Instructor at the Central Flying School, Wiltshire. He was soon afterwards promoted to Captain. 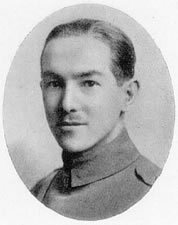 Later he was sent to Ayr to train inexperienced pilots, and it was while flying there, during an exercise on 8th February 1918, that he was killed in a flying accident at the age of 25. He is buried in North Merchiston Cemetery.